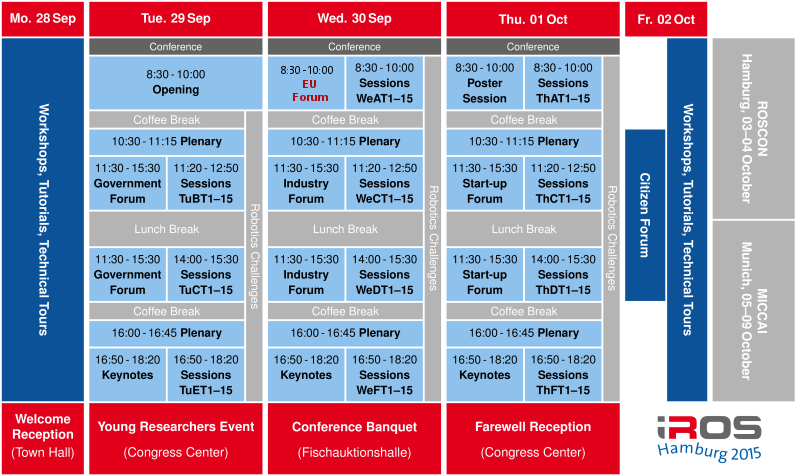 Please see the figure for the overall schedule of the IROS 2015 conference, or click the figure to open a PDF. The main conference runs from Tuesday (29/Sep) until Thursday (02/Oct), with workshops and technical tours on Monday (28/Sep) and Friday (02/Oct).The IROS exhibition also runs from Tuesday (29/Sep) to Thursday (02/Oct). Click here for the preliminary technical program. The final technical programme including plenary and keynote talks, and details about the social programme will be announced soon.